Designed with a modern style and strong build, this vanity is a perfect choice for any bathroom. This simple vanity set from American Imaginations will fit right into any bathroom decor. Includes adjustable floor levelers under the legs for uneven floors. Knock-out plumbing backboard for easy water supply and drain access. Crafted with solid wood and veneer with a multi layer 7-step finish. No assembly required. Faucet and accessories not included. Designed with a modern style and strong build, this vanity is a perfect choice for any bathroom. The good-looking grey marble counter and brown solid wood base make a big difference in your bathroom. With drawer and double-door cabinet, this vanity set is also great to keep items in. Bring a classic look and feel to your bathroom with this beautiful set from Art Bathe. Use this vanity to bring more modern style into your bathroom. Its white acrylic counter and brown mdf base are very easy on the eyes. Made with a roomy single-door cabinet and drawers, this vanity has lots of room to keep items like toothpaste, towels, and hair brushes. This set from Cutler Kitchen Bath is great for anyone looking for great style and function in their bathroom. This vanity has both an all-around look and a modern style. The good-looking white acrylic counter and brown fiberboard base make a big difference in your bathroom. This set from Wyndham Collection is great for anyone looking for great style and function in their bathroom. Enjoy the popular modern look in your bathroom with this beautiful vanity. With a white artificial stone counter and brown fiberboard base, this piece is very stylish. 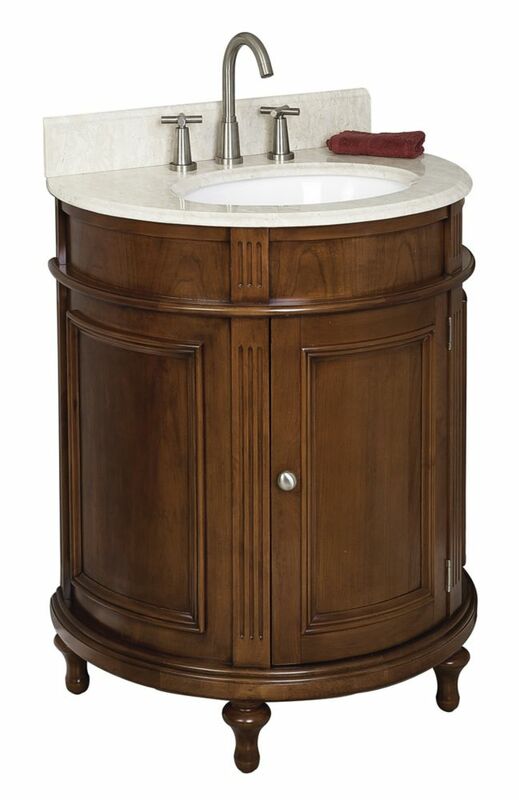 Put a nice twist on your bathroom project with this classic piece from Wyndham Collection. 30-inch W Vanity in Brown Designed with a modern style and strong build, this vanity is a perfect choice for any bathroom. This simple vanity set from American Imaginations will fit right into any bathroom decor.